A new report from the Investment Company Institute (ICI) highlights some recent trends in Americans’ retirement wealth. Specifically, $25.3 trillion were held in IRAs, defined contribution (DC) plans, annuity reserves, and public- and private-sector defined benefit (DB) plans at the end of the fourth quarter of 2016. That is an increase of $338 billion (1.4 percent) from Q3 2016, and $1,464 billion (6.1 percent) higher compared to a year earlier. Moreover, total retirement wealth ended last year at a new all-time high and accounted for roughly a third (34 percent) of all household financial assets in the United States. 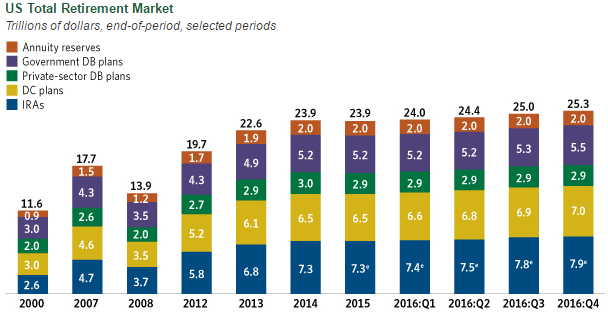 Much of the gain in Q4 was due to employer-based defined contribution (DC) plan assets, which totaled $7.0 trillion at the end of December, an increase of $83 billion (1.3 percent) from Q3 and another new record high. 401(k) plans accounted for 68.7 percent ($4.8 trillion) of total DC assets last quarter, of which the majority was invested in mutual funds. Most of these assets were kept in equity funds but hybrid funds, which include target-date funds (TDFs), have been quickly gaining ground. In fact, target-date fund assets have increased 558 percent in just the past decade, according to data from Morningstar. That is not too surprising given that a TDF simplifies the investment process for plan participants by routinely adjusting the asset mix of stocks, bonds, and cash equivalents in its portfolio so that the holdings are kept appropriate for the target investor’s changing nearness to retirement. This automatic rebalancing feature is one of the main reasons why TDFs have become quite popular over the past few years. TDFs, though, are far from perfect because they do not take into account an individual’s unique risk tolerance, net worth, tax situation, and other potentially critical variables. Alternatives exist, such as “robo-advisors,” which can often provide a lower-cost option for portfolio management by utilizing mathematical modeling and minimizing human intervention. Robo-advisors already seem to be popular among high-net-worth investors, and more information on this burgeoning arena can be found here.